The early 80’s were a great time for fantasy films and that era produced many of my favorites including, Conan The Barbarian, Clash Of The Titans, Excalibur, The Beastmaster and this film as well. The Sword And The Sorcerer is a bit more lighthearted than the above pictures and the tone is very tongue in cheek. However, a fairly well made, coherent and enjoyable adventure flick was made. The plot is pretty straightforward as Talon, son of King Richard has grown up and is a swashbuckling rogue mercenary that stopped home for revenge on Cromwell for killing his family and to liberate the kingdom from Cromwell’s tyranny. Our hero Talon, played by Lee Horsley is a hybrid of Han Solo and Conan. In my opinion, Talon has more in common with Han Solo than Conan though. While our hero is quite capable in battle, Talon has a lot of homeboys and they come out of the woodwork to help Talon in his time of need. Of Talon’s homies, Captain Morgan is my favorite. The underrated Richard Lynch gives the best performance in the film as main villain and usurper king Cromwell. Talon is armed with a triple bladed sword that can shoot at people as well. There is a lot of great action here as well as some decapitations, gore and T+A. 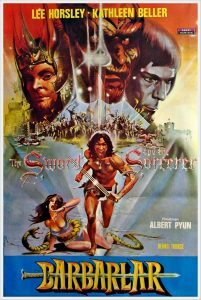 Overall, The Sword And The Sorcerer is a fun, action packed fantasy film that does not take itself too seriously. However, the film is not so campy that it is too over the top to have the audience take it seriously when the story needs it to be.